For more on liberty and its relationship to the Pluralist Commonwealth, see Chapter 2 of American Beyond Capitalism. The Pluralist Commonwealth model is also based on the judgment that individual liberty requires institutional, not simply ‘legal’ support. The traditional small firm, entrepreneurial and small farm populist systems were based (at least in theory) on the principle that sustaining liberty was possible only if individuals were firmly anchored in the economy. The Pluralist Commonwealth model also holds that unless individuals are protected and supported economically, their capacity to speak and act freely is severely limited. Again, if there is to be genuine institutional support for liberty of action and speech, individuals in a meaningful democracy must have adequate time available to pursue political and other goals. A major premise of the Pluralist Commonwealth model is that time must, accordingly, also be made secure—both for these reasons and to open new possibilities for individual and community expression and development. The issue is obviously intimately related to questions of equality, and of planning to allocate time. The economy currently (2013) produces the equivalent of just under $200,000 for every family of four. Over the course of the twentieth century, per capita GDP adjusted for inflation increased roughly seven-fold (even though the economy experienced a massive depression, numerous recessions, stagflation and stagnation, two world wars, and several smaller wars). If the economy were to produce per capita growth similar to that of the last century over the course of the twenty-first century, the equivalent income per family of four would average roughly $1 million (not counting inflation – more in all probability in current dollars). Alternatively, the workweek might be cut in half, to roughly 20 hours—and income equivalent per four person family might still be roughly $500,000. 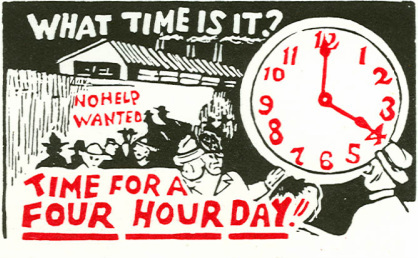 Or, further, the workweek might be cut to 10 hours with income reduced to roughly $250,000. Obviously, resource limits and the course of productivity gains, on the one hand, and economic functioning on the other, might significantly alter such very general order-of-magnitude estimates. Nevertheless, the Pluralist Commonwealth model holds that not only is a redistribution of work-time possible, but that it is also a necessary condition of democratic participation and of personal liberty—liberty, that is, to use one’s time as one sees fit. Including politically. For more reduced work hours, see Chapter 17 of American Beyond Capitalism. "On Liberty," Boston Review, October/November 2000.